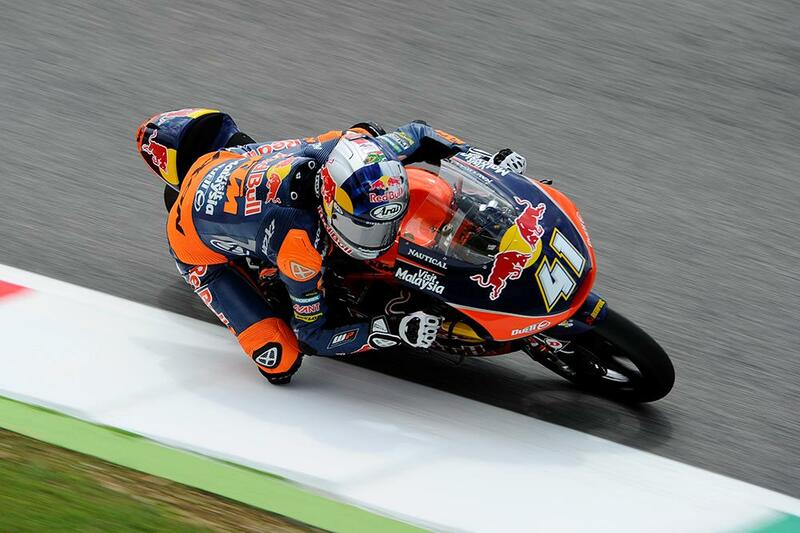 Brad Binder has taken his third successive victory in one of the closest races in Grand Prix history, taking the victory despite the top five finishing it separated by only a tiny 0.077 seconds. Coming out of an incredible battle the top man, Binder nonetheless was able to use his racecraft to leave himself in the perfect position to capitalise on the line after a frantic race that saw a 21-rider pack battling for the win until the last lap. Fabio Di Giannantonio took his first points-scoring finish in second, in only his seventh Moto3 race, while Franco Bagnaia came home on the final podium spot, albeit only 0.006 ahead of Niccolo Antonelli – with Fabio Quartararo a tiny 0.002 behind him! Pole man Romano Fenati was an unlucky victim of mechanical problems, robbed of a chance to fight by a broken chain, while title contenders Canet and Navarro crashed out. John McPhee made it home in 23rd, struggling after becoming one of only four riders to get dropped from the pack dicing for the lead on his underpowered Peugeot.